When a WordPress site uses your plugin and something goes wrong, they usually need help as soon as possible. Even if your plugin is freely-available in the WordPress Plugin Directory, it’s a good idea to provide prompt user support. After all, a good reputation will serve you well should you decide some day to develop premium plugins for a profit. Good customer service is more visible than great coding, and should be taken seriously. A few years ago, plugin authors had a difficult time keeping apprised of new support requests on the WordPress.org forums specific to their plugins. RSS feeds for specific plugin support threads have been available forever. Email notification of new support topics, however, has not. For my first plugin, I wanted email alerts every time someone entered a new support thread in the forums. The way I did that at the time was to use Google Alerts. That turned out to be a great solution, because I received alerts for new talk of my plugin anywhere on the web–not just the WordPress.org forums. The phrase you want to be alerted for when Google finds it on the web. General places you want Google to report your query from. Specify how frequently you want to receive alerts. Attempts to limit your results based on how relevant a query result actually is. Sets which Gmail account you want alerts sent to. As you change your search query, a live preview shows typical results your will receive for that query. You can use advanced query tools, too, such as “-television” to ignore results containing the word “television.” Click “Create Alert” when you’re ready to go, and see what happens over the next few weeks. In the WordPress Plugin Directory, each plugin has its own page. Different tabs organize the content into sections. In May 2012, the support forums were integrated on the page in a “Support” tab. Behind the scenes, each plugin essentially was given its own forum. This by itself was a great move, along with other changes to the plugin pages. WordPress heavy Otto tells me that about a month after the support tab came along, he added email subscriptions for each plugin’s support forum. Lo, behold: developers could now sign up to each of their plugin support forums and stay on top of the newest threads. Sign in with your WordPress.org account at WordPress.org. Go to the plugin page you are interested in. Scroll to the bottom of the list of support topics. Use the link in the lower left corner to subscribe. Note, there is no way to subscribe to alerts for all plugins in one fell swoop. Personally, I think that would be kind of nuts, anyway. Even if you do want to do it–you just can’t. Each plugin is subscribed to individually. RSS notifications for new plugin support requests have always been available in one form or another. The new RSS notifications enabled in May 2012 are compiled a bit differently behind the scenes, but should provide you the same notifications when new requests come in. To get RSS notification of a plugin’s new support requests, just follow the same instructions for getting email notifications. The RSS link is right on top of the email subscription link. This might seem a bit out there, but it has served me well. People having problems with your plugins may not come to the WordPress.org forums for support. Some people don’t know the forums are there, and others are just frustrated and want to vent elsewhere. A hosting company successfully connected with me a few years back when I ranted on Twitter about an outage. They responded–despite my not having contacted their support yet–and our issue was resolved. 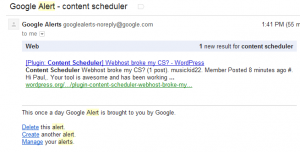 Google Alerts help find references to your plugins in many places around the web. Twitter references, however, may often be significantly delayed or nonexistent in your Google Alerts results. There are a number of reasons for this, beyond the scope of this article. For that reason, you might consider signing up for a Twitter notification service. Twilert looks to be decent, and you can search the web to find many others. These services work similarly to Google Alerts, but just send you results found on Twitter. You should know by now that any time you provide a service or product, communicating with your customers is a key component to prolonged success. Even if you cannot fix your users’ problems right away, you need to acknowledge the problem, the users’ pain, and let them know what you intend to do about it. I hope you can use these notification ideas to help you stay on top of issues. What are you doing to stay on top of support issues? To encourage user feedback? Please let me know in the comments.